This CAPRI model built in 2014 is located in beautiful Valencia Lakes, Floridaâs premier 55+ community and is your own paradise to call home! For Sale and on Sale, what a great value! Enter the double door entry to the open floor plan with diagonal tile leading out to the lanai, bring private tranquil views right to your door! The kitchen has light cabinets, granite, upper, lower lighting, glass tile back splash, cabinet pantry and all stainless appliances too! Large master has attached master bath has both garden tub, walk in shower, dual sinks with upgraded faucets too! This tasteful decorated home has neutral colors, fans and light fixtures throughout. This truly move in ready property has water softener, gutters, screen front entry, hurricane shutters and of course, location, location location! The laundry comes with washer, dryer, and sink too! To fence or not to fence that is the question. Yard is perfect for your furry friends and comes with mower to make sure the lawn is perfect! No back yard neighbors and pie shaped lot give lots of open space to enjoy. At Valencia clubhouse and lifestyle center, you'll enjoy resort and walking resistance pool, spa, pools, sauna, cafe, ball room with stage, game and pool room, aerobics studio and gym, tennis courts, pickle ball, basketball and beautiful walking and biking trails, sports, dog park and much more! 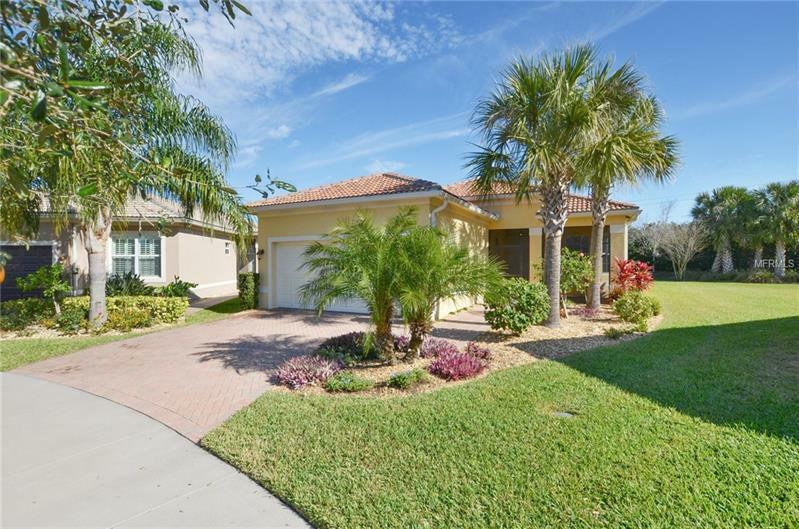 You'll love the gorgeous entrance to this beautiful gated community. Here's to your new life at Valencia Lakes where you are on vacation everyday!